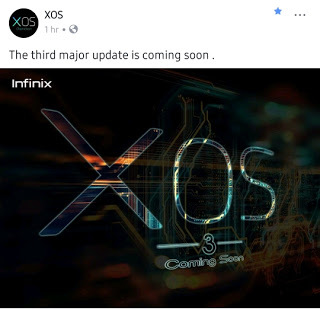 Infinix just announced that another version of its customized UI the XOS 3 will be coming soon to Infinix devices , although the expected date and time was not stated ,they made the announcement on their official page . As already known the XOS always comes with amazing features one among them which is 3 fingers feature ,we are yet to have an idea on what feature the XOS 3 will come with. Lets Just keep our fingers crossed and expect the best from Infinix On this XOS 3.